Dr Sravan Kumar Appani is a Consultant with an overall 5 years’ experience in the field of Rheumatology. He has been actively involved in treating several cases of Arthritis and Autoimmune disorders, administration of newer molecule like biologics, performed several Joint Aspirations and Intra-articular Injections. 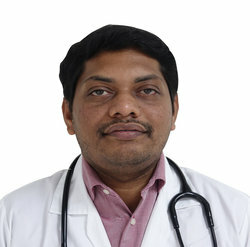 He completed MBBS from NRI Medical College, NTRUHS, MD(General Medicine)-NIMS, Hyderabad DM (Rheumatology)-NIMS, Hyderabad. His is an active member of Indian Rheumatology Association (LM 1202), API (Association of Physicians of India), Indian Society for Primary Immune Deficiency ISPID (ISPID/18/S-21), MyoIN (Myositis India Research group). His special interests include management of Rheumatoid Arthritis, Osteoarthritis, SLE (Lupus), Sjogren’s syndrome, Scleroderma, Spondyloarthritis- Ankylosing Spondylitis, Psoriatic arthritis, Antiphospholipid syndrome (APS), Crystal Arthropathy like Gout, CPPD, Vasculitis, Takayasu arteritis, Paediatric Connective Tissue Disorders, Juvenile Arthritis, Myositis, Interstitial Lung Diseases-ILD, Primary Immunodeficiency syndromes, Sarcoidosis and Osteoporosis. Dr Sravan Kumar gave presentations in many National and International Conferences. He has also been as a Co-Investigator in Clinical Trials. Study of Serum Procalcitonin in patients with Sepsis, Septic shock and Systemic Inflammatory Response Syndrome. (2011-2014) MD Dissertation.